Soundarya Rajinikanth and Vishagan Vanangamudi tied the knot on February 11, 2019 at the Leela Palace in Chennai. It was a star-studded affair and pictures from the event took the internet by storm. It was a second marriage for Rajinikanth’s daughter Soundarya as well as for actor and businessman Vishagan. Apart from the beautiful moments from the wedding that we all have seen already, there is something else that happened and it left everyone stunned. A statement made by Vishagan to Soundarya at the mandap, minutes before the wedding rites, was something unbelievable. 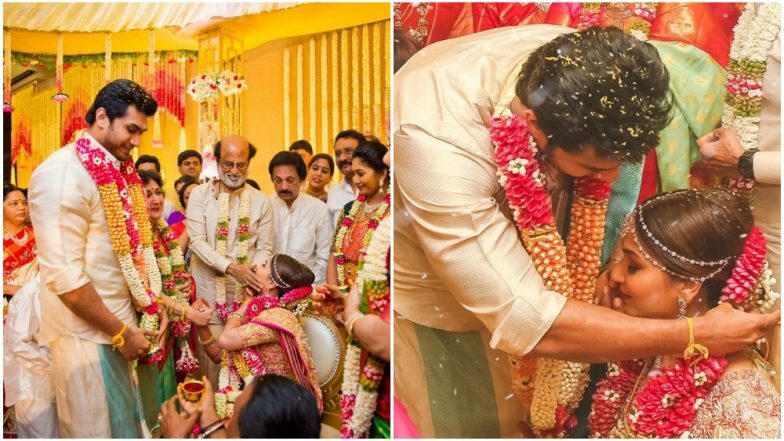 Soundarya Rajinikanth - Vishagam Vanangamudi Wedding Reception: Check Out Inside Pictures From The Star-Studded Affair! In an interview to the JFW Magazine, Soundarya Rajinikanth spilled the beans about what happened before the couple tied the knot. This candid confession made by Soundarya will melt hearts. Soundarya revealed she was very tensed to not see her son Ved besides her before the ceremony. She was quoted saying, “Ved took a liking the first time he met Vishagan. I showed him Vishagan’s picture and said: “see daddy”. Vishagan is very patient with Ved. It was the Muhurtham time and Ved wasn’t at the mandapam yet. I was really tensed but Vishagan turned towards me and said, “I will not marry you until Ved arrives.” Ved feels a sense of protection with Vishagan and that’s what I needed. We wanted our kid to see and know everything. Vishagan actually asked permission from Ved if he could marry me and we have taken a video of that. We will show Ved the video once he turns 18." Rajinikanth, Soundarya and Vishagan Make a Terrific Trio at the Akash Ambani – Shloka Mehta’s Wedding Celebration! See Pic. Isn’t that the most beautiful thing that Vishagan Vanangamudi did for Soundarya Rajinikanth? We are sure, it is something that she would cherish for the rest of her life. Soundarya was earlier married to industrialist Ashwin Ramkumar. The couple decided to get separated by mutual consent due to irreconcilable differences.